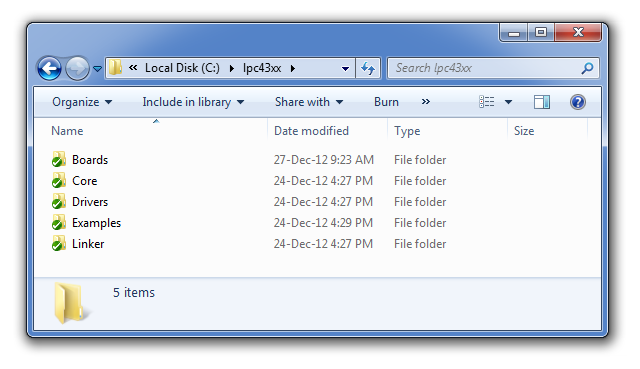 The Boards folder contains the demoboard specific files. These files define the on-board LEDs and buttons. It also contains drivers for the demoboard that are not part of the CMSIS-Compliant Standard Peripheral Firmware Driver Library (e.g. external SDRAM). The Core and Drivers folders contain the corresponding parts of the LPC43xx (or LPC18xx) CMSIS-Compliant Standard Peripheral Firmware Driver Library. 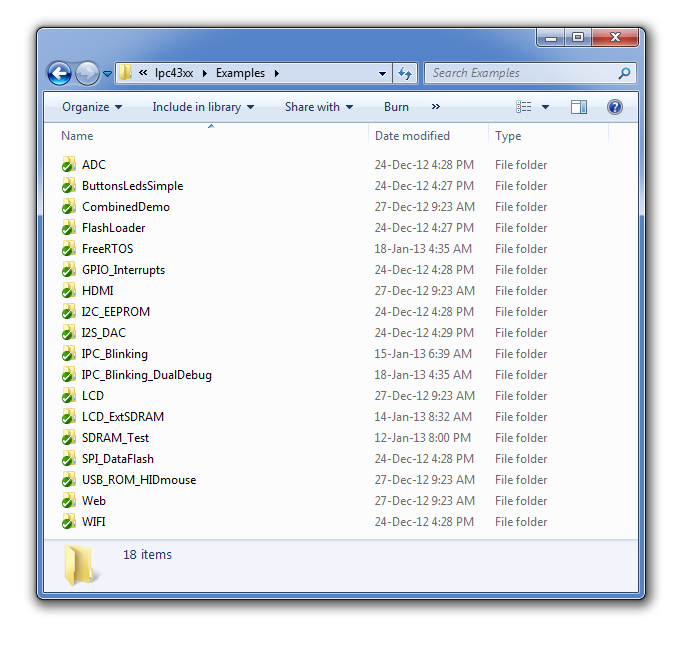 The Examples folder contains source code of examples for LPC4350-DB1, LPC4357-DB1 and LPC1850-DB1 development boards. In the following sections we will examine these examples in detail. The Linker folder contains flash loaders and linker configuration files for IAR Embedded Workbench and KEIL Embedded Development Tools for ARM . The primary example files (main.c, config.h, etc.) are located in the root of the example folder. 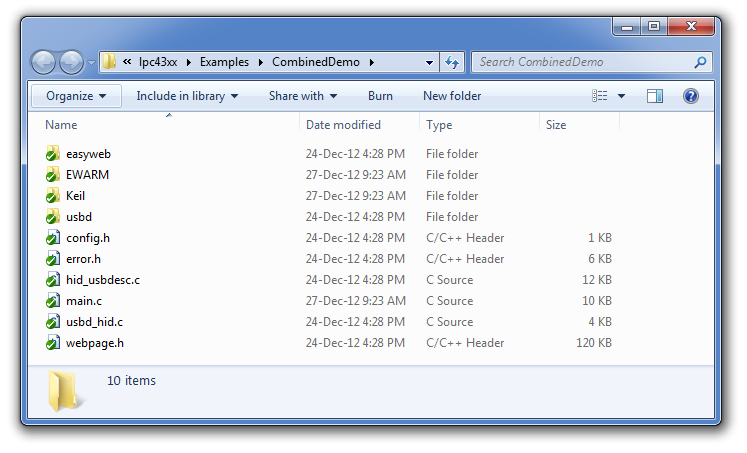 EWARM folder contains project and workspace files for IAR Embedded Workbench . Keil folder contains project and workspace files for KEIL Embedded Development Tools for ARM . Additional subfolders can be present if the example uses third-party libraries - the easyweb and usbd subfolders in the Combined Demo example. The *.ewd file contains debugger settings. The *.ewp is a project file. The *.eww is a workspace file. Workspace contains one or several projects. User should open this file to run an example. The *.uvopt file contains the environment settings for current project. The *.uvproj is a project file. User should open this file to run an example. Some of the examples consist of multiple projects. The workspace file (*.uvmpw) is present in this case.